Getting Here: Seattle to San Juan Islands | Fly, Drive or Ferry! Friday Harbor on San Juan Island is located 90 miles north of Seattle, in the beautiful Salish Sea. Friday Harbor is easily accessible by foot and has many great local shops, restaurants, and hotels. Fly from Seattle: For an easy and hassle free day tour, fly directly from Lake Union in downtown Seattle to the docks of San Juan Island! The Whale Plane Package includes roundtrip air with Kenmore Air from Seattle to San Juan and our Whale Watch and Wildlife Tour. Drive the scenic by-way from Seattle to Anacortes and hop aboard the Washington State Ferry that is considered one of the most beautiful ferry rides in the country. Enjoy comfortable seating or walk around the viewing decks and take in views of the surrounding islands while traveling to San Juan Island. Look for seals, eagles, porpoise, and even orca whales as you travel between along the calm channels of the Salish Sea. Outside and inside seating, tables, and a galley make travel on the ferry easy and fun. The ferry lands right in the heart of Friday Harbor, just steps from our office location. From Downtown Seattle: Allow at least 1.5 – 2hrs driving time. Take Interstate 5 north to the Burlington exit (230). Turn west (left) on Highway 20 until you reach Anacortes. Once in downtown Anacortes, follow the signs for the San Juan Island Ferries to the ferry landing. The Ferry: Choose a ferry departure that arrives to San Juan Island at least 1 hour prior to tour time and plan on arriving at the Anacortes Ferry Terminal at least 1 hour prior to ferry departure. If you are visiting San Juan Island for the day, it is recommended you leave your car in Anacortes and purchase walk on tickets. For ferry schedules click here. If you are NOT bringing your car across park your car and purchase a walk on ferry ticket. Passenger only is about $13 per adult – round trip. If you are bringing your car across, reservations are highly recommended. To make vehicle reservations visit www.takeaferry.com. The approximate price for car & driver is about $50 round trip, passengers extra. San Juan Island, located 90 miles north of Seattle, is a fun and easy day trip from Seattle. 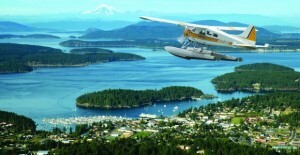 Take the ferry from Anacortes, WA or hop aboard the Whale Plane. Sea planes depart from Lake Union in Seattle, which is a short taxi ride from most hotels, and return to Seattle for dinner. Contemporary, great furnishings and appointments. In the University District. Starbucks on the lobby level. Great, warm front desk staff. Very helpful. April 2010. Cruise the San Juan Islands on a moped from Susie’s! Enjoy the great outdoors and see wonderful scenery. Susies’s rents cars and scoot cars too! San Juan Islands source for rental cars and car sales located in Friday Harbor. 360-378-8887 Hourly scheduled shuttles Friday Harbor to Roche Harbor. First run 10:00 to Roche Harbor. Last run of day 4:25 Roche Harbor to Friday Harbor. Can accomodate 4 bicycles. $8 round trip. Between San Juan Islands, Victoria and Anacortes. Miss the ferry?